Todd Pleeter, pictured on the right, met with Lingraphica's Aphasia User Group to test out his app called Aphasia Tunes. Read on to find out what they thought. Ten years ago, Todd Pleeter, an aerospace engineer at the time, had a stroke. For the first three months following his stroke, Todd couldn't speak. Getting out one word at a time—like his son's names—was incredibly difficult. While Todd was recovering and trying to overcome his aphasia, he learned to create apps through an online program called xcelMe. Currently, Todd has two of his own apps in the App Store: Coin Flipper and justbreathe. The Coin Flipper app is his most-downloaded app and ranks in the Top 200 downloaded apps in Denmark. The app flips a coin, landing on either heads or tails. justbreathe is a mindfulness app that sounds a soothing gong to remind users to take some time out for a few deep breaths. Perhaps the most intriguing app, especially for those who also have aphasia, that Todd created is the one still in testing mode: Aphasia Tunes. "I wanted to create something that people with aphasia might really enjoy," said Todd. "The Aphasia Tunes app is my attempt to do that by making a game out of songs that users will likely recognize." To create the app, Todd compiled 600 songs over the span of 30 years. Three decades of music hits are represented—the 50s, 60s, and 70s. To play, users choose one of the three decades. A song will begin to play from that decade, and three artist choices will appear on screen. The user then decides which of the three artists performed the song. If the answer is correct, a green check mark appears; if the answer is wrong, a red X appears. Todd has also included Wikipedia links to each of the artists featured in the app. 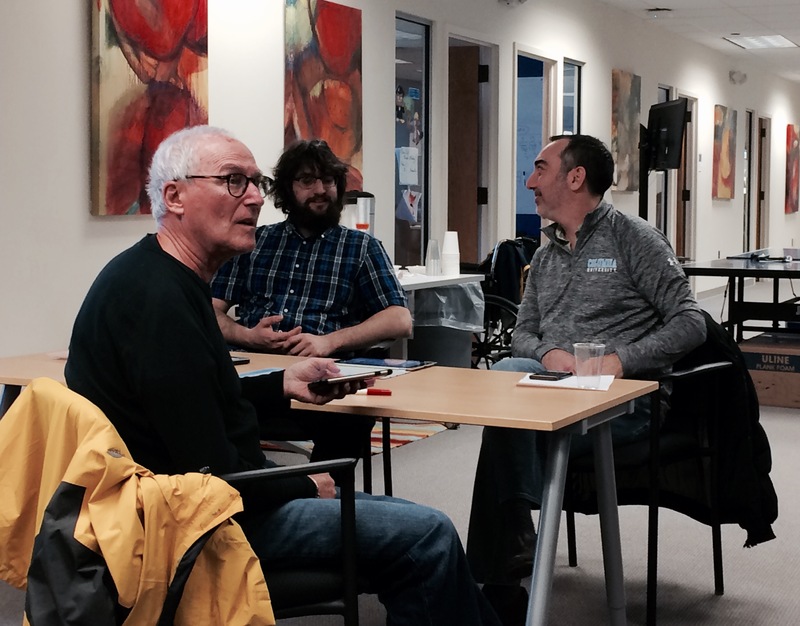 In January, Todd visited Lingraphica's Aphasia User Group to share his app-in-process and ask for feedback. To say that the members of the group "loved" his app is a gross understatement. The demonstration, which was slated for 30 minutes, went well over the time allotment because the group didn't want to stop. The video below shows a glimpse of the enthusiam surrounding Aphasia Tunes. "This is a good app. I love it...very nice!" "Please come back for every User Group meeting!" "Nice work, guy! Nice work...Oh my God! Yes, yes, yes!" Paul, a member who had a stroke 19 years ago, was Todd's biggest fan. A man who loves music and takes part in musical productions at his assisted living facility, Paul hummed vigorously along with every song that came up. There was a light in his eyes that grew brighter with each new tune. When asked if the songs took him back in time to relive memories, he put his hand over his heart, closed his eyes, and fondly responded, "Oh, YES!" Todd is still testing and tweaking Aphasia Tunes, but when the app becomes available to the public, Lingraphica will share the news with our newsletter readers. Stay tuned for the release of Aphasia Tunes!